This article is about a mountain in San Marino. For other uses, see Guaita (disambiguation). 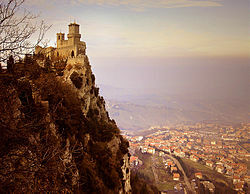 The Guaita fortress is the oldest of the three towers constructed on Monte Titano, and the most famous. It was built in the 11th century and served briefly as a prison. It is one of the three towers depicted on both the national flag and coat of arms. It was registered as one of the World Heritage Sites in 2008.